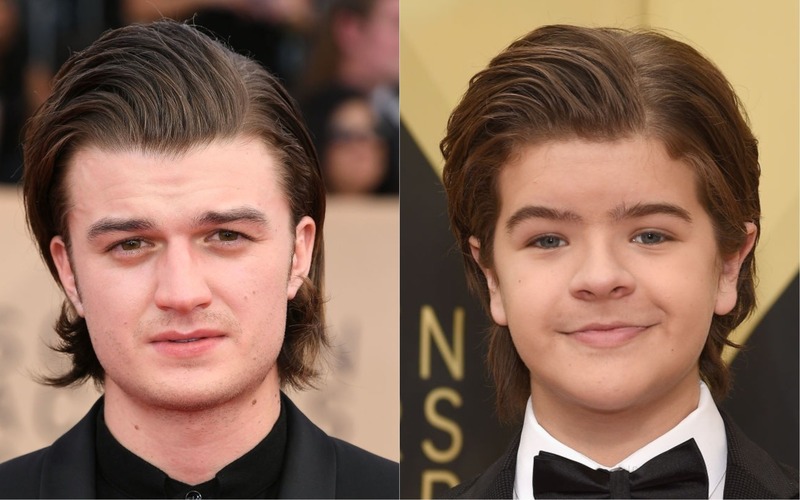 In an adorable move pulled straight out of Stranger Things 2, Joe Keery and Gaten Matarazzo showed up at the 24th Annual Screen Actors Guild Awards wearing the *exact* same hairstyle. Taking a quick break from saving Hawkins, Indiana from a host of Upside Down-related horrors, the cast of Stranger Things turned up at the SAG Awards looking like the coolest kids at the Snow Ball. We were quickly taken by Millie Bobby Brown complementing her dress with Converse, Natalia Dyer’s gorgeous gown, and the dapper looks sported by Noah Schnapp and Caleb McLaughlin, but there was one look that made us do a double take — and had us reaching for Fabergé. Matarazzo rolled up to the SAG Awards without those iconic curls, instead rocking a slicked back look that’ll surely have Steve Harrington watching his back. But making things even more adorable, Keery arrived rocking the exact same look — down to the part. Keery’s recent trim even gave their twin ‘dos, a near-identical length, and we’re here for it. During the second season of Stranger Things, Steve Harrington (Keery) and Justin Henderson (Gaten Matarazzo) became the unlikely dream team, after each found themselves a little lost, lonely, and looking for someone to lean on. While Dustin gave Steve the companionship he needed as he contemplated his future — possibly one without Nancy Wheeler — Steve helped Dustin find his inner confidence. Sure, the final few episodes of the season found us swooning over Steve’s newfound love of babysitting a group of tweens. But in the end, Steve’s bromance with Dustin endured in the most adorable way possible. And Matarazzo took a cue from his Stranger Things character and stepped up his game for the SAG Awards. And thus, the student becomes the master. Tragically, the duo didn’t pose together on the red carpet, with Keery posing with his fellow Stranger Things high schoolers, and Matarazzo hanging with his fellow A.V. Club members. We’re still keeping our fingers crossed that the two secretly snapped pics together inside the event — because their twin hairstyles are definitely frame-worthy. And we’re definitely going to need to see more of this in Season 3.